AA Metatron ~ Quantum Consciousness & The Nature of Time | Illuminations Now!! This article may strike some as a complete mind warp; however, it is the closest description of what I call “Integration Lifetimes” that I have ever seen or heard anyone else describe. It also touches somewhat upon the premise behind this month’s Timeline Tune-In, Tune-Up. Since so many clients request additional reading materials on these topics, I felt called to post this James Tyberonn piece here. If your conscious mind doesn’t “get” it, no worries; your subconscious knows exactly what he’s talking about! Perhaps these words will ignite a few sparks of recognition in the conscious realm. As regular blog readers know, I don’t often post channeled material here, but I do if the message resonates and/or articulates topics I feel important to share. Thanks to Gillian for posting this one! Greetings, I am Metatron, Lord of Light and I greet you all within this precise vector of timeless space. I embrace you in unconditional love. Dear Ones, Light is an enigma to you. It exists in succinct units termed photons. Photons have no density, and no charge, and they travel as both particles and waves at 186,000 miles a second. At the ‘speed of light’ time, as you understand it, disappears. Photons of light go so fast that time has stopped for them. A photon leaves the surface of a sun or star and races through space for what you perceive as vast light-years, and then illuminates your eye as you gaze upward at the array of heavenly stars. It seems paradoxical to you that the instant the photon left the star and the moment it struck your retina, are the same. No time has passed for it at all. In this way, light permeates your realities and it is time-less, literally. You are beings of Light, and as we have just shared, light is timeless. Speed influences the manner in which you experience time flow, but it does not necessarily influence the ‘units of consciousness’ you experience within time. The faster you move through space actually slows down the movement of time. Space has 3 measures in physical reality: length, width and height. Time and space are connected in a fantastic structure called space-time. The movement of consciousness in time flows through space and thus time becomes a fourth measure forming the space-time. You refer to these as dimensions; they are in this context perhaps better described as measures. In pragmatic terms, linear space-time is the measure of experience that keeps you from encountering everything at once. Quite an overload ! Time and space are aspects of the same mechanism. Space, in a manner of speaking is congealed time held in a matrixial kinetic format within duality that allows for the separation and program of the purposed programmed illusion of sequential time metrics. Accordingly time is the inverse of space, in dynamic free flow. Both occur though the harmonic flash of consciousness units, through mechanisms of the inward and outward pulse of matter to antimatter and vice-versa via black holes and white holes. This may be termed the ‘Harmonic Cycle.’ Matter, like light, occurs in spectrums. The inward -outward Harmonic Flash is not only the point in which space and time merge into a homogenous foam , it is also the rate of consciousness unit perception that strobes attention of awareness into each simultaneous lifetime. This ‘micro-flash’ occurs at a magical rate approximated at very near what is termed the Planck Number, occurring at 10 to the power of -43 of one second. 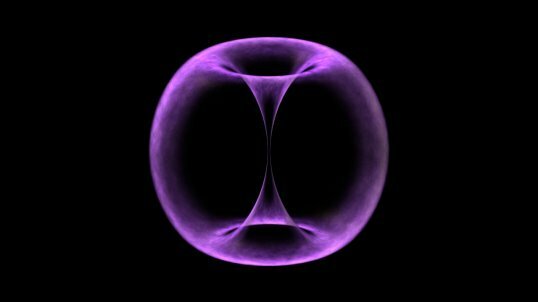 At this point time and space merge and become nonlinear and the Torus aspect comes into play. Space is inverted, turned back upon itself, and time units float in a nonlinear discontinuous quantitized pool of what you term past, present and future. In this quantum gestalt, the space-time continuum dissolves, and in a manner of speaking becomes simultaneous ‘event’ streams, event horizons all co-existing in one integral ‘now’. It is a amalgamation, an experiential quantum soup intricately aggregated with every event, every potential and probability from each lifetime. You have heard the song ” On a Clear Day You Can See Forever’ …literally this specific ‘vectorless’ sphere is the clear day of all potential forever’s. It is also the point from which time holograms are projected, as well as the center from which the harmonic pulse transforms matter spectrums. Matter shifts into antimatter realms and antimatter is downshifted into matter to form physical reality. Both are pulled in and projected out (and vice-versa) in the harmonic flash via black holes & white holes. In physical realms, white holes) bring in the energy of consciousness that forms reality, and black holes phase out the energy. It occurs at an unimaginable velocity and it is the means of the ‘strobe-effect’ of your consciousness stream sequencing into all of your realities, all of your lifetimes. In the not too distant future your scientist will make discoveries that lead to theories supporting this process. There is evidence of it now. It has been noted that electrons in their circulation around the nucleus of the atom seem to ‘disappear’ for a few microseconds, and although this is surmised to be quantum tunneling, it is actually a phasing in and out of dimensions. It is the ‘Torus’ effect of the spectrums of the harmonic cycle. It occurs atomically in all matter. All physical matter fluctuates in and out, including your physical world, and of course your physical body. Such refractive fluctuation also occurs psychologically on a very deep, extremely profound mental level. Your awareness phases between all lifetimes in somewhat the same way. Yet it seems to you that your consciousness in all lifetimes is a seamless streamline. It is an illusion. All lifetimes are in greater aspect simultaneous. This harmonic pulse is the mechanism of ‘simultaneous lifetimes’. You flash in and out of each lifetime, and are unaware of any absence in any of them. They all seem continual. But we tell you that in far less than the time it takes to snap your fingers, you have had a ‘perception unit’ of consciousness in every other lifetime. There are no gaps of cognizance , because the awareness rapidly moves in and out. As an analogy, your earlier (non-digital) films appeared to be unbroken movement, but were actually individual still frames, with undetectable gaps between them. The individual frames (representing separate lifetimes) moved so quickly through the projector light that they appeared as seamless movement. Such it is with your concepts of linear time, except that the undetectable spaces between the separate frames, take you to other ongoing realities, other lifetimes…and the projector light is your consciousness.. There are many such in- out points of points of reciprocal refraction, but your physical senses are purposely unaware of them. To experience them all at once would be far too much information ! And this same phenomenon occurs on the physical consciousness spectrum. The 3d brain (personality-ego) consciousness of each separate lifetime comes alive and awake to its particular individualized existence in the harmonic flash, but in between are other fluctuations in which attention is focused upon succinctly contradistinct schemes of reality; each of these other “lifetimes’ jumping to alertness, fully awake and responding, yet each unique personality having no sense of absence. They are absolutely unaware of any gaps or absence, each flash then is like the individual frames of the motion picture and the flashes occur so quickly that linear continuity is perceived by the ego personality brain in each ongoing lifetime, within the individualized framework of each succinct time hologram. We are aware of how confusing and how incredible this may seem to you. Yet the greater part of you is fully aware of this process. It is a fact of physicality, of physical existence in the polarity realms. Accordingly the greater aspect of each of you is not locked within linear time or physical reality. The divine (subconscious) mind (not the 3d brain) can and does perceive other time epochs and exists in other realities of even greater multidimensionality. In the ‘New Earth’ of 2013 and beyond, there are changes in place that will allow you greater access to your multidimensional lifetimes, your simultaneous lifetimes occurring in the holograms of time on the Earth-Plane. This ‘Torus Effect’ we first brought forward several years ago as it is pertinent for the coming ascension of humanity as taught in the Metatronic Keys. By harmonizing all simultaneous lifetimes, a requisite soul harmony is achieved. The aspects of soul fragmentation are brought into ‘Soul-ar’ harmonic integrity. This is an essential Metatronic Key…the requisite of harmonizing all sojourns. Lifetimes are chosen with specific purpose, and some of these purposes can occur in different frequencies that seem in opposition. Certain lifetimes are dedicated to learning nuances of love as service, others into learning responsible creativity, others for learning how to manage ‘power’ and strength. In your physical planes there are 144 variations of these, 12 primary aspects with 12 subcategories in each. It is not uncommon for lifetimes dedicated to learning service to be in frequential opposition to lifetimes in which you learned how to manage power and develop strength. The beliefs held in lifetimes of service may be very psychologically different from beliefs formed in a lifetime dedicated to developing strength. These varying beliefs may have been necessary and appropriate for the benevolent goals of each sojourn, but as each soul approaches completion, a rebooting is required to ‘update the files’, by removing what no longer serves the higher purpose. Lifetimes of opposing beliefs can become polarized. This may be termed as soul fragmentation. These need to be harmonized. You may have developed beliefs in a lifetime of lesser intellect that are limiting to your expanded intelligence in another. And in the lesser lifetime, those beliefs continue to create the reality of that simultaneous sojourn. You may have a lifetime in which a catastrophic tragedy created a great fear, or a sojourn in which you had a strong (false) belief in the existence of ‘evil and demons’. Such erroneous unlearned beliefs can interfere with development and seem very real to the senses of the entity in that lifetime specifically because the physical senses will perceive according to beliefs, even if the beliefs are limiting and inaccurate to the greater reality. As such that lifetime will go on creating in a limited paradigm until the soul changes them from the universal seat of power. One can and must transfer learnings from an advanced lifetime into one in seeming contradiction. As an example it may have served you in a lifetime in a religious order to take poverty vows. You may have developed the belief in a series of lifetimes in the ‘cloth’ of priesthood or nunnery that ‘money is evil’ and all material things must be shunned. And now you find yourself in a lifetimes where you understand that money is a tool, and that it is not an evil to be avoided. That it can in fact be utilized in higher good. Yet you are unable to manifest it. With the knowledge that all lifetimes are ongoing simultaneously, you may have 10 lifetimes continuing to reject money, and only one or two trying to create it. In the overall flux you are being outvoted 10 to 1. You have the ability in Mer-Ka-Na exploration to go back and up-shift contrary belief into one that fits a greater understanding, a greater truth. Keep in mind that each lifetime is a new start in many aspects. Regression can occur in certain scenarios. The great Edgar Cayce achieved Mastery in many lifetimes before his incarnation as Edgar Cayce, yet he had a lifetime in America as ‘Bainbridge’ , just prior to his Cayce incarnation in which he was a roguish character. In a very applicable sense, this serves as an example of the nonlinear aspect of lifetimes. Just as the Golden Age of Atlantis is actually in your future, but has been drawn into your seeming past because you cannot perceive that future epochs influence the present. In the same way you think that all lifetimes have a sequential effect in terms of learning ratios. You cannot imagine that an initial learning experience might occur in a future rather than a past timing, unless you expand your belief to understand that time is NOT linear. Do you understand? We will discuss this in greater detail in part 2 of this channel. Dear Human, There is no real impermeable division between your soul essences (lifetimes). You have the ability to influence all lifetimes in this moment. In this now. Time separations only seem to be real in the purposed illusions of the duality based physical realm . That is not to say that the dramatic lessons you learn are not at times quite searingly painful and extremely difficult. Masters if this purposed illusion did not feel real to you, you would not learn in the Law of Cause & Effect. That is why we called in ‘purposed illusion’ While you are in duality it is very very real. But when you in one sojourn learn that all reality is created by belief you can change the beliefs of untoward experiences in other aspectual lifetimes. And when you do this, you are preparing the final Path of your Ascension. It is a quantum leap. We wish to tell you that physical lifetimes in duality are a means of extraordinary growth, of exquisite spiritual evolution. You think of humanity in the duality realm as having spiraled downward, and while the density aspects are in that sense a devolution of experiencing cause and effect, the greater truth is that lifetimes are freely chosen here in duality. Duality experience is not a punishment, rather a credentialed course in mastery …one that you have deliberately chosen. It is not easy , and we honor you for that courage. And we tell you that you will graduate, you will Ascend….All in Time ! End of Part One – Part Two of this channel will be released in one week. This entry was posted in Channeling, ContraMary, Reblog, Uncategorized and tagged Contemplation, Reflections by ContraMary. Bookmark the permalink.